Whether for fun and play or for special appearances, the following Santa's helper costumes are sure to spread jolly cheer. Santa's helpers include Mrs. Claus, Santa's reindeer and all of the toy shop elves. Without his helpers, Santa could not make and deliver toys to all the boys and girls around the world. 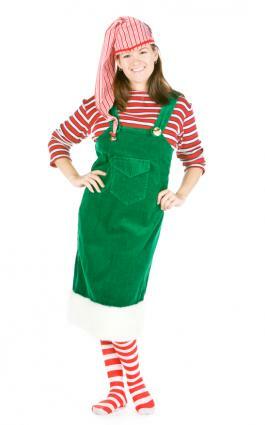 Santa's helper costumes are needed for parties, parades and plays. Men, women, children and even dogs can dress up as Santa's helpers. Following are ideas on buying or making your costume. Elves are Santa's busiest helpers. Most people visualize Santa's elves as wearing little green outfits. You can make an elf costume easily by wearing green sweats and a Santa's hat. However, if you are looking for a more elaborate costume, check out the Internet for costumes you can buy or sew. Wearing your Santa's helper outfit will certainly get you and everyone around you in the holiday spirit. Whether you are pulling Santa's sleigh, making toys or simply baking cookies, dressing up as one of Santa's helpers is sure to make the season bright.